Next week automotive companies and enthusiasts travel from around the world to convene in Las Vegas for SEMA. As we near the last few days before the big show, there are still builders frantically rushing to complete the last finishing touches on the impressive show cars that line the countless rows of the convention center. As the premier automotive aftermarket trade show, SEMA is the place where many of the world's top builders display their latest projects while companies show off new products for the upcoming year. 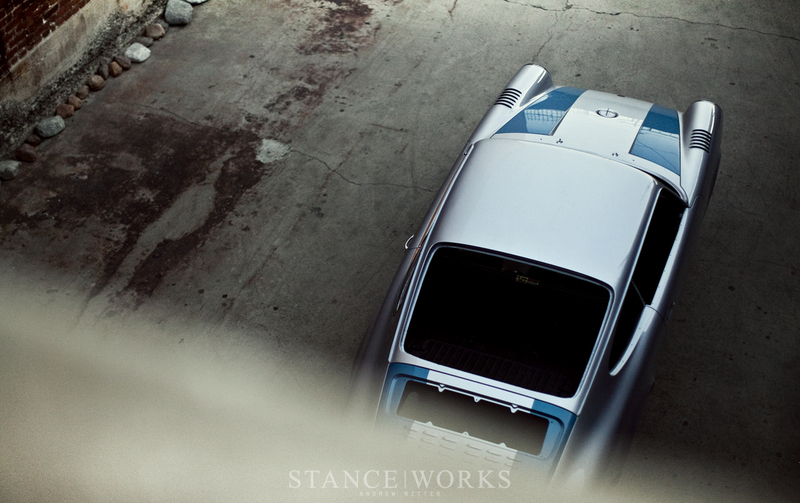 Though Magnus Walker certainly isn't new to the realm of car builds, 2014 marks the first year that he'll attend SEMA to display his work. In his usual unique ways, however, Magnus is taking a step off the beaten path and bringing an incomplete car to Vegas. Over the years, the world has become familiar with the builds that roll out of the brick laden shop in downtown LA. Following murmurs and teaser photos, the cars charge out from the garage, over the bridges, and through the canyons, flaunting their bodywork and singing with their tuned engines. Each time, we're teased by glimpses at parts and left to guess what he has up his sleeve, but this time is different. This time, Magnus has chosen to bring us all in on the build and give a glimpse at what goes into them. 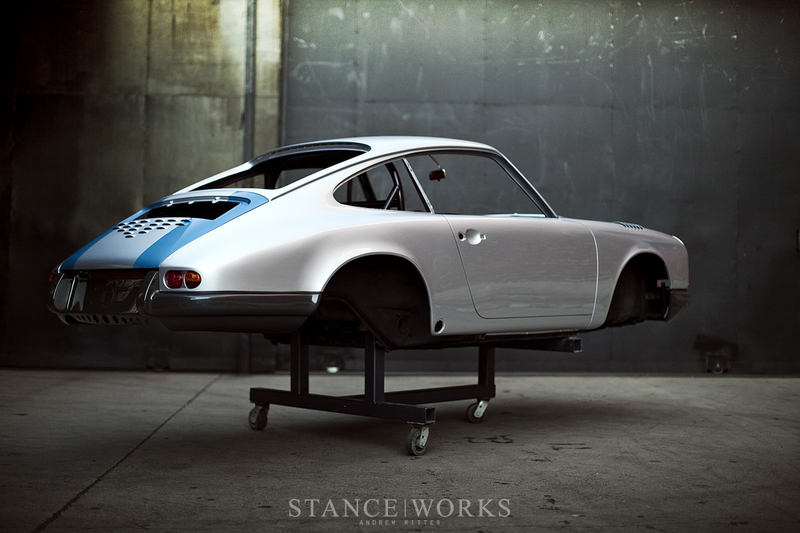 Six or seven years ago, you would've found no less than 5 Porsche 911 67Ss behind the doors of Magnus's garage. The rare model, sought after as the Holy Grail of early Porsches by many, hadn't reached the high value that it pulls in today. Amongst his collection sat this very 67S. Purchased in 2007, the old 911 was in desperate need of love but it wasn't until a few years later that rust repair would commence and the project would be under way. The car was rolled into a blast booth to unveil the rust that hid under the aged paintwork. Time had eaten away at the floors and attacked the parcel shelf. The usual rust spots were all weakened and weathered, so it was wheeled into 'The Chop Shop' to fit replacement panels, ensuring that the body was restored to its original vigor. Once completed, primer was applied to ward off future corrosion, but then its journey came to an abrupt halt and it sat....for years. Two years ago, during the filming of Urban Outlaw, the 67S still sat in the background on the same wheel stand, coated in primer with its bright orange bumpers and contrasting black hood. While other builds came and went, it remained in the garage with its potential untapped. Magnus always took moments to pause and ponder the car's future and play out ideas in his head, dreaming as we all do about the different paths that he could take. For 4 or 5 years, the car lived in this uncertain dream world, but 18 months ago, its number was finally drawn. The dust was brushed off the restored shell and it once again became the project at the forefront of Magnus's thoughts. 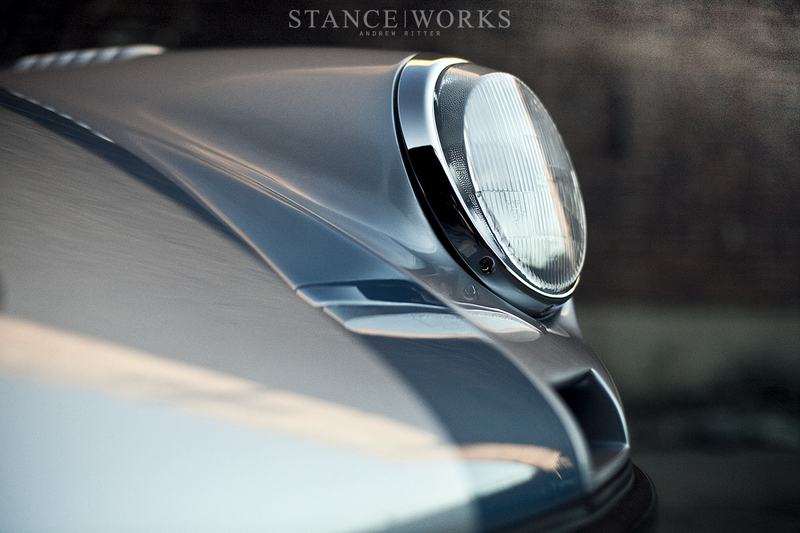 As the first model year of the 911 S, the '67 is considered by many as THE top model in the long lineage of Porsches. It has garnered a prestige with its history and limited numbers and it has attracted the collectors and purists seeking out their own pristine, numbers-matching examples of the iconic 911, but Magnus remained undeterred on his path to cut into the classic and make it his own. 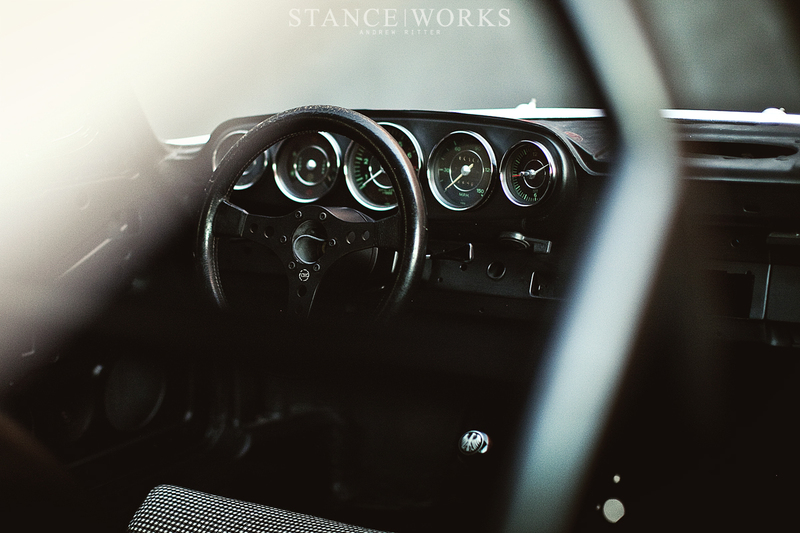 Inspired by the 911R and the Porsche racing pedigree, he began working on the subtle details to add a bit of aggression to the mild demeanor of the narrow bodied short wheelbase car. Drawn from the classic quest for lightweight performance in racing, Magnus's signature drilled-hole aesthetic has been used throughout the 67S RT build. It catches your eye and you begin to see it repeated in various forms, stringing the aesthetic from one part to the next. In racing, the holes that cut into any non-structural part of the old race cars were the result of a desperate battle to drop weight wherever possible in the hopes of improving lap times. The 5 drilled holes that often grace his door handles have been brought around to the hood to decorate the fin of his hood filler cap. From there, the eye naturally dances to the same 5 hole pattern that allows air through the front bumper to cool the oil that courses through the car's veins. 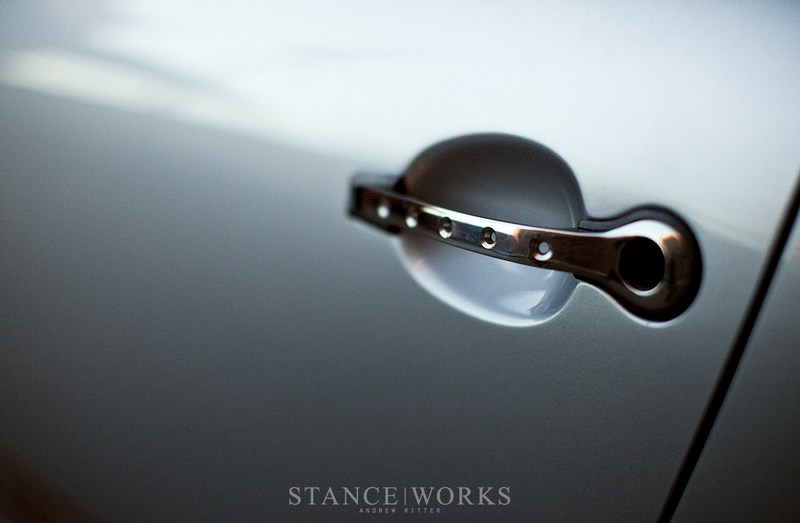 With the steel front bumper, it was possible to use a dimple die to achieve the same depth and bevel as the door handles, further continuing the aesthetic. 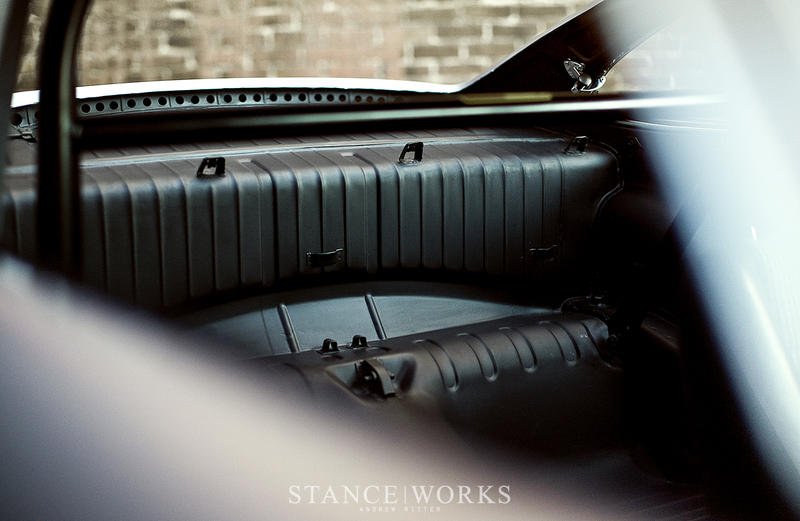 Along the rear bumper, holes line the bottom edge and bring the styling cue to completion. Following his STR build, with its sculpted fenders and crafted lines, Magnus knew he had to do something special so that the 67S RT could follow suit. He wanted to do something that hadn't been done before but still stayed true to the Outlaw philosophy that he incorporates with each project. Once again, he turned to racing for guidance. The Porsche family has a strong history in racing and it includes some of the vicious legends of track battle. 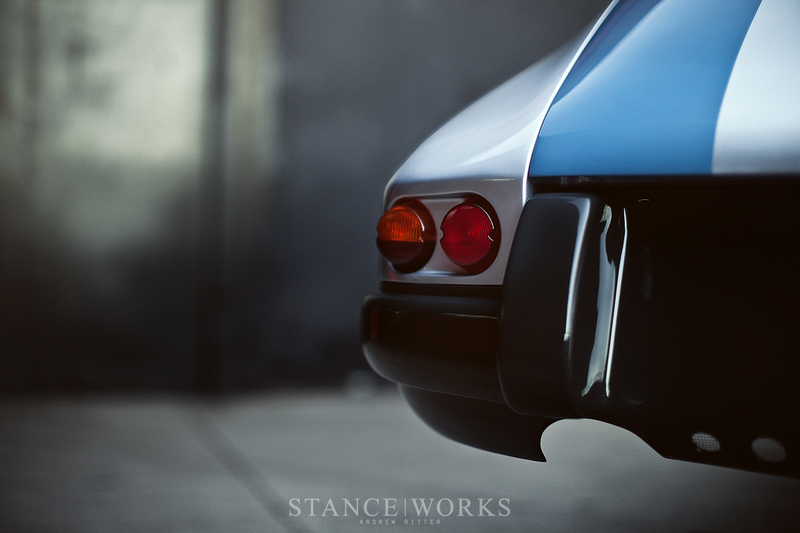 The 917 and 935 still stand as iconic examples of performance and engineering, so as he pondered, he began to focus on some of their unique characteristics. The details that caught his eye were the inverted louvers that lined the front fenders, relieving pressure from the front wheel wells. Magnus been incorporating the hot-rod-esque louvers on his outlaw decklids for years, so the fender louvers presented an opportunity to continue that through while also paying tribute to the powerful machines that paved the way for Porsche racing. With plans laid out, Magnus reached out to the guys whose dies helped shape his panels in the past. Unfortunately, the shape of the fenders presented more of a challenge than the flat decklid and he ran into hesitation at each shop that he approached. 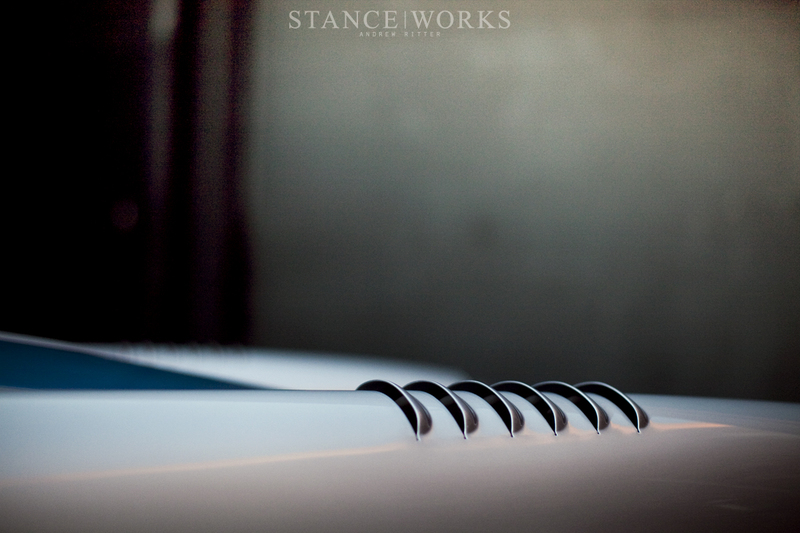 The flatter fenders of the 935 and 917 meant that the inverted louvers could be applied without too much difficulty, but the tall steep curve of the 911S's fenders wouldn't be so easy. 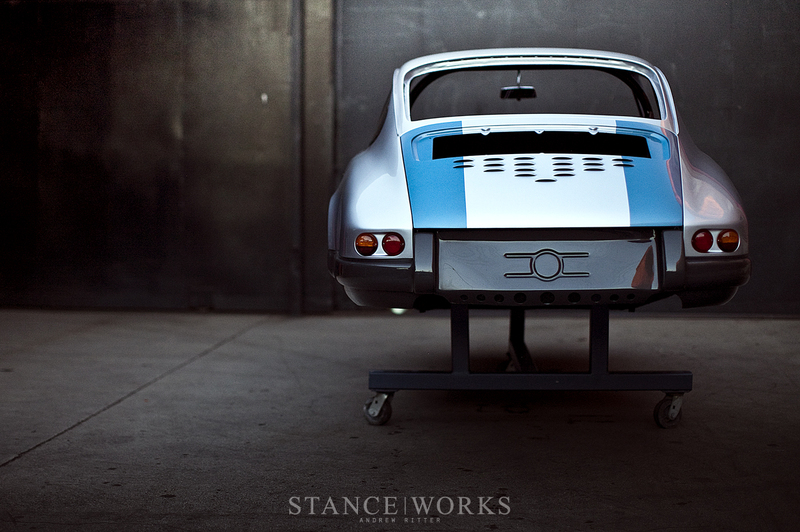 Determined to make his vision a reality, Magnus turned to Rod Emory, a man known for his Outlaw Porsche 356 builds and his skills as a metalworker. Rod, always eager to find solutions to the challenges that others deem impossible, gladly accepted and they began scanning the complex contour of Magnus's fenders. 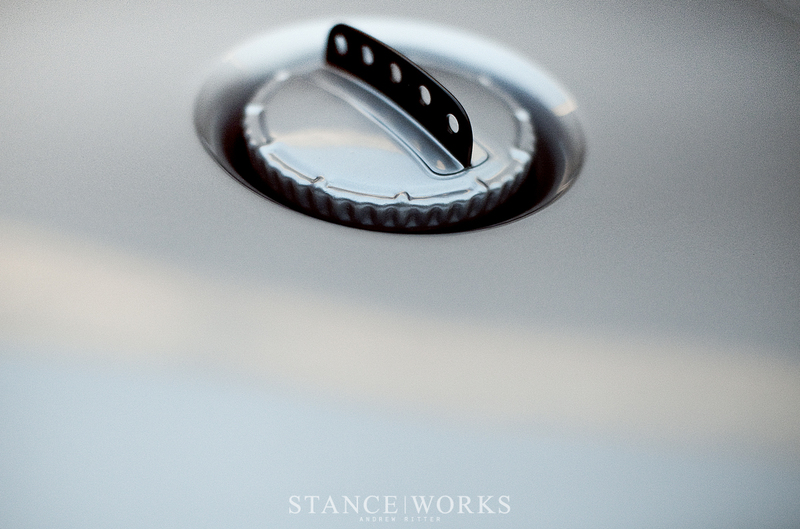 With the curve mapped out and a CAD illustration complete, a custom die was machined to press right into the fender. With standard louver dies, the act of cutting the metal and pressing the shape is done in one fell swoop but with the added rigidity of the curved shape, holes had to be pre-dilled and lines had to be pre-cut to allow the metal to properly stretch and accept the new form. While the holes would often be welded to clean up the finished piece, Magnus elected to retain them and shed light on the handmade nature of the process. In preparation for the big show, Alchemy Paint in Long Beach took on the task of adding color to the shell that had sat for so long in its orange and primer coating. Opting, once again, for a multi-color livery, Magnus played with shades of greys and blues for the body. 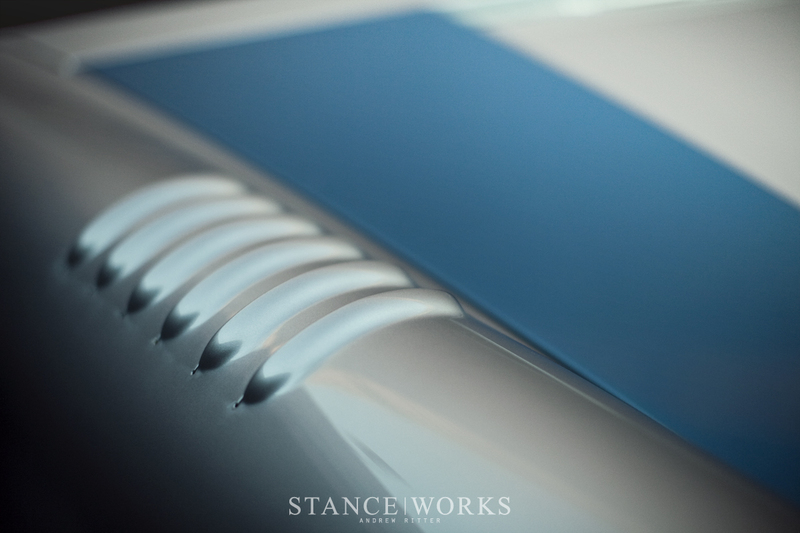 Metallic blue stripes run the length of the hood and decklid and terminate into the deep gray bumpers that shine with hints of cobalt blue in the right light. A stunning silver creates the base and shines over the slightly wider LWB flares that had been grafted on to accept 7" wide wheels. 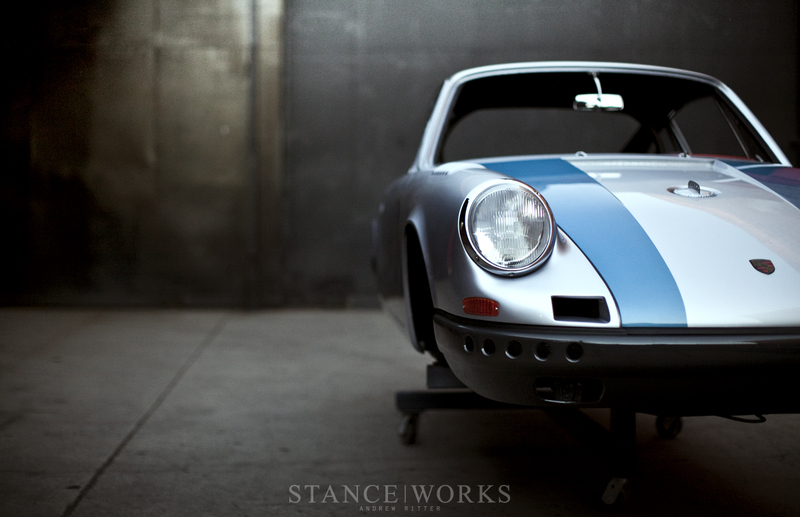 To add a bit of contrast to the Porsche side stripes, an orange copper compliments the natural blues of the paint. The result was an absolutely beautiful shell that sat before me as the sun set on LA's skyline...but the problem was that SEMA was only a week away. 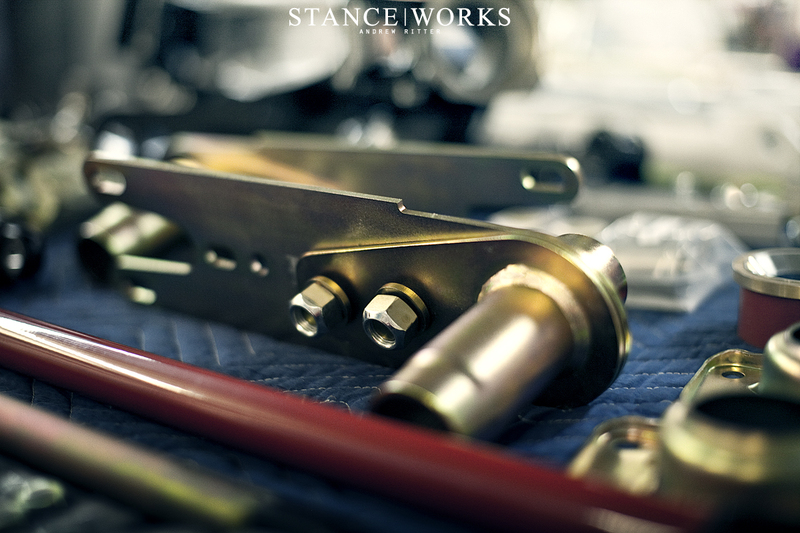 The shop's table was line with CAD plated bolts and top-of-the-line suspension parts from KW Suspension and Elephant Racing. Brake rotors and calipers lay strewn apart and control arms sat alone. There was still a way to go before it would be ready, but Magnus assured me that it was all part of the plan. With big dreams for the motor build and intricate plans for the interior, it would still be a few months before I heard it roar to life and rip through the city streets. 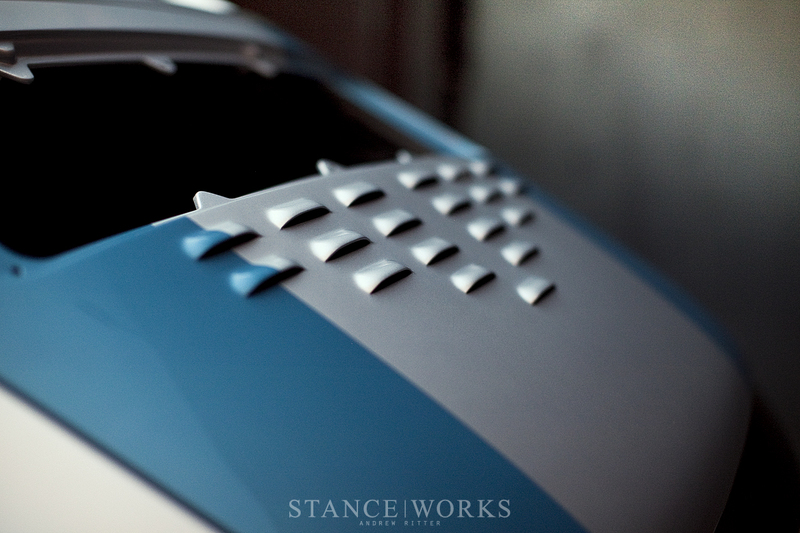 His goal for SEMA was simply to invite his fans in to see the steps that go into his builds. Often we're only offered the final product and while they are always stunning, it's hard to really appreciate everything that goes into each one. 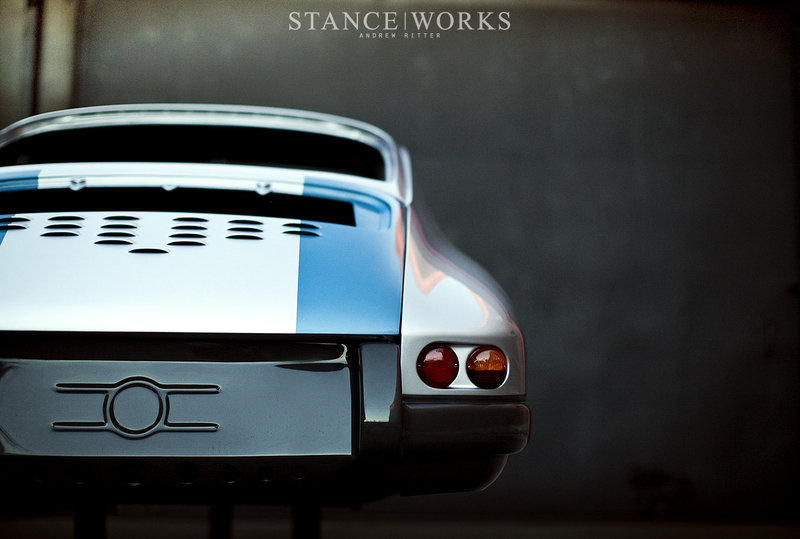 So, this time around, the 67S RT will be on display at SEMA as a work in progress. 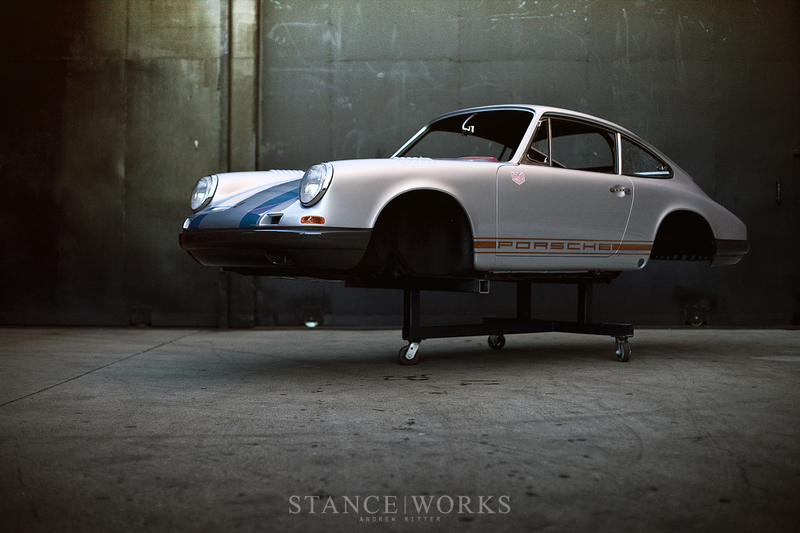 Viewers will be able to approach the car and look under the fenders to see the array of new parts that make up the suspension and stopping power of the little road and track prepped SWB 911. It's a step away from his usual unveiling tactics, but it's a great opportunity for those of us who'd love to see what goes on behind the doors of his shop. So, if you want to explore the build stages of the 67S RT, join Magnus in the Mobil 1 booth at this year's SEMA. Mobil 1 has been a strong supporter of the Porsche team for ages and it continues on as they invite the 67S and 277 into their booth for the event. We all hope to see you there. Looks awesome, can’t wait to hear it running. Absoltuly love it! This is inspiration for all of us! And wonderworking photos! Wish I could go to SEMA. I would love to see this in person. Despite all of the noise from the naysayers I have to say that this is an absolutely beautiful car. It’s one that I certainly admire, and I can’t wait to see how it all turns out! great looking piece. another homerun from magnus. Irking you obviously have never been the person shaping the metal with your own hands to create something special- until you have, you wouldn’t get it. 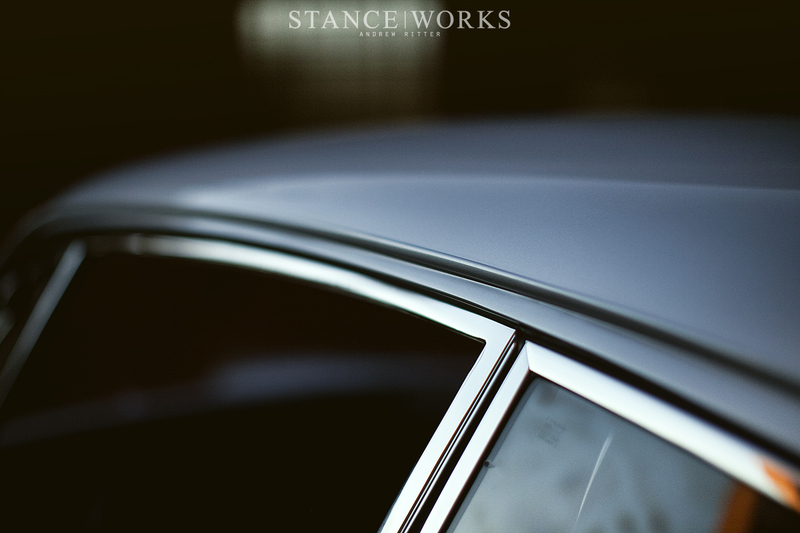 It’s not just the finish of the car and how popular it is, it’s equally the life your work takes on as it evolves. Andrew Ritter…. do you know the status of this build? is it finished, still being built or pushed back in the corner after his wife/soulmate passed away last year?